Wow. What a find on my lawn! As I noted in an earlier post, I am skeptical that the extinct North American “cheetahs” are the root cause of the pronghorn’s speed. I am not alone in this skepticism, but my skepticism is rooted in the evasion strategy that pronghorns use. They flat-out run, whereas the antelope that are part of the true cheetah’s prey sources often use complex twisting and turning behavior to evade the swift cat. The pronghorn is a super long-distance runner, and its evasion strategy is more in keeping with a creature that was hunted by long-running dogs or perhaps the only hyena that ever existed on this continent. I’ve been thinking a lot about cheetahs lately. A few weeks ago, I was watching an episode of Nature on PBS in which the filmmakers were putting cameras on various animals. They put some cameras on some young cheetahs, and I was somewhat surprised at a species they seemed to like to target. They were constantly harrying and harassing bat-eared foxes. It was at that moment that two ideas I had in my head were connected. I’d been toying around with writing something on this space about the Afrikaans name for the bat-eared fox, which is “draaijakkals.” The name means “turning jackal,” and the animal got this name because when a dog would get after one, it would start twisting and turning as it ran. Now, this certainly would be the fox for sighthound enthusiasts to course. But it really doesn’t need this skill to hunt its prey. In South Africa, it was believed they were a threat to lambs, but the truth is that 80-90 percent of their diet consists of one species of harvester termite, which don’t require much chasing. Their running behavior is an evasion strategy, not a hunting strategy. Cheetahs do not regularly target bat-eared foxes, but when they do, they are successful pretty often. Gus and Margaret Mills, who studied cheetahs in Kalahari, reported that cheetahs rarely hunt bat-eared foxes, but when they did, they managed to catch and kill their quarry 44.4 percent of the time. One emaciated cheetah queen, though, came to target bat-eared foxes as a major part of her diet. Cheetahs are not migratory species, but many of their prey sources are. And during times in which ungulates can’t be hunted, some of them could very well come to rely upon bat-eared foxes as their favored prey. Although bat-eared foxes do derive from a basal lineage of vulpine foxes, the exact species first appeared in the fossil record 800,000 years ago. And they evolvedin areas where cheetahs were present. This little hypothesis has some problems. One of them is that cheetahs don’t often target bat-eared foxes, but we do know cheetahs will when they are unable to hunt ungulates. But does cheetah predation on bat-eared foxes happen enough to have had that effect upon the canid’s evasion strategy? I don’t know if we can answer that question, but it seems to me that the bat-eared foxes’ odd twisting and turning and doubling back behavior comes from cheetah predation as a selection pressure. It is worth considering. Maybe I am way off, but I don’t know of any other canid that runs from predators in this fashion. Or maybe it’s just another Just-So Story. What’s killing bat-eared and Cape foxes in South Africa? A general rule in canids is that bigger canids kill and persecute smaller ones. In this case, black-backed jackals are killing off Cape foxes. That would not be such a problem, because leopards keep jackal numbers in check. This is a great example of the mesopredator release hypothesis, which holds that when larger predators are removed from an ecosystem, the smaller predators become more numerous and the species they normally kill suffer as a result of this imbalance. Of course, the ranchers don’t want jackals either, but I guarantee you that they’d rather have jackals than the leopards. When top level predators are taken out, all sorts of things happen to the lower trophic levels. Increased predation by jackals on these two species of fox is just a consequence of removing leopards from the ecosystem. As you know, bat-eared foxes have very strong pair bonds, and the yapping mate that comes up at the end is really not having a good day. If we can say that animals can feel extreme anguish and alienation, then we can clearly see it here. One of the secrets of the dog family’s success is that they generally aren’t specialists. Even the rodent-eating Ethiopian wolf (Canis simensis) will occasionally take a small antelope, like the common duiker or the mountain nyala. And although there are several species of desert fox that eat large amounts of insects, none of them has specialized in eating only a single species. However, there is a canid that lives almost exclusively on one insect species. The species in question is the so-called “bat-eared fox” (Otocyon megalotis). 80-90 percent of its diet is the harvester termite (Hodotermes mossambicus). We cannot say that the bat-eared fox is entirely specialized to this diet. If it cannot find harvester termites, it will eat other insects and maybe the odd lizard or small mammal. But no other wild dog lives on such an insect-laden diet. These foxes have evolved to have more teeth than other canids– 48 versus the 42 teeth that all the other dogs have. And the teeth themselves are smaller and less designed for shearing. The selection pressures that keep most dogs with shearing carnassials have been removed from the bat-eared fox. The small teeth are well-designed fro gripping termites, even if they are not very good at cutting flesh. After all, harvest termites aren’t particularly hard to hunt. All the fox needs to do is use its comically huge ears to locate the termites and then dig in and eat. Compared with the complex cooperative hunting that one would observe in say a dhole or a wolf, this is pretty weak sauce. However, bat-eared foxes do occasionally live within social groups that consist of a mated pair and one or two of the female offspring from a previous litter. These older offspring help the mated pair rear their young. These foxes have very strong paternal parenting behavior. The male bat-eared fox regurgitates food for his offspring, and then he helps groom them and guard them while their mother forages. He also is known to play very rough with his babies. It is thought that male of this species is the parent most responsible for socializing the offspring and for preparing them for life on their own. Now, paternal parenting behavior is very common in canids, but in no other species is the father this important to the development of the young. Typically, it is the father who take the kits out on their first termite hunt– often when they are only four weeks old! No other male dog does this with his pups. The mother does almost nothing but nurse them. s species has an unusually long lactation period of 14-15 weeks. Once the kits are weaned, both parents go foraging with them. 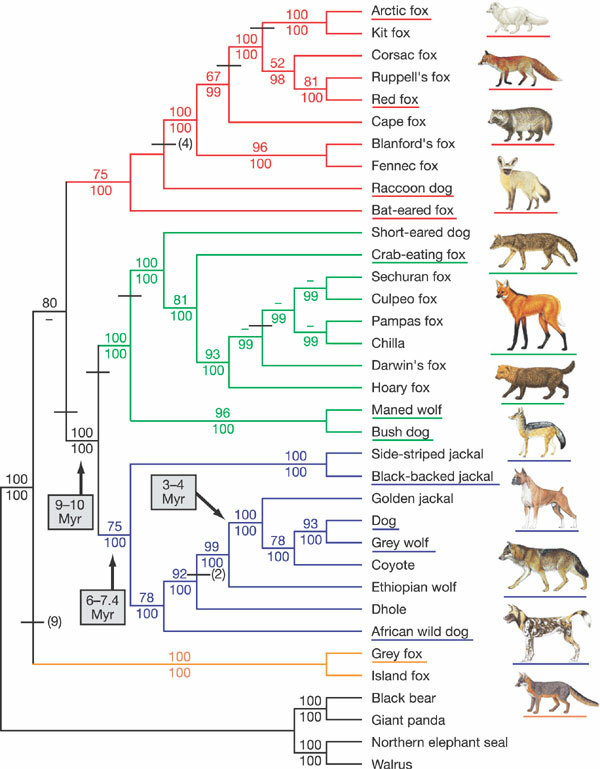 There is some debate as where bat-eared foxes fit on the canid phylogenetic tree. Early genetic assays and much of paleontology classified the bat-eared fox as a basal canid. Typical dog family phylogenetic trees have the bat-eared fox, the raccoon dog, and the Urocyon gray foxes as the most basal of all canids. Each is usually placed in its own monotypic subfamily. However, the phylogenetic tree of Canidae that was drawn from sequencing the dog genome revealed that bat-eared foxes and raccoon dogs were more closely related to the true foxes (tribe Vulpini). 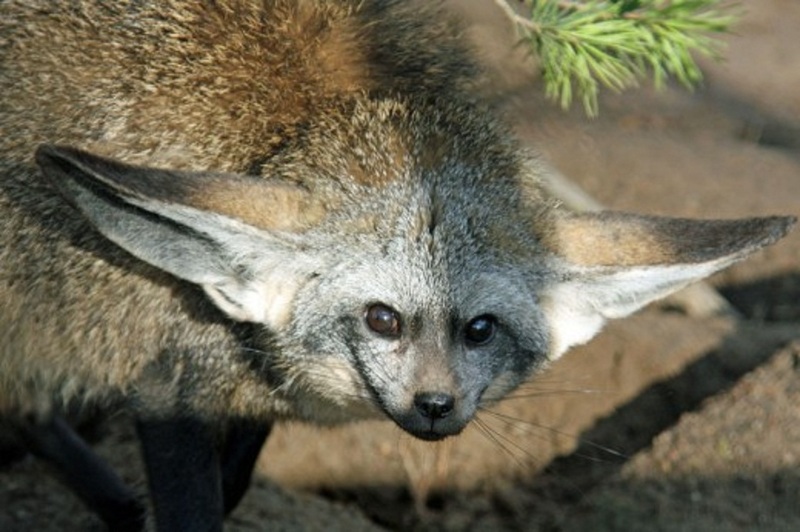 The bat-eared fox is actually the most primitive of all extant Vulpini. If we had hard time classifying the bat-eared fox, we also had a hard time naming them. In English, this species has been called the spoon dog. It was so-named because its spoon-shaped skull. Settlers to the Dutch colonies of South Africa saw an affinity between this fox and the jackal. Ironically, one of the bat-eared foxes worst enemies is the black-backed jackal, and otocyon are no more jackals than they are vampire squid. The names for them in Afrikaans refer to them as jackals: bakoorjakkals (“bowl-eared jackal”) or the draaijakkals (“turning jackal”). The latter name comes from one of the escape strategies these foxes employ when they are hunted. If a bat-eared fox thinks its being pursued, it will repeatedly double back on its tracks– turning, if you will. This behavior will confound hounds and even expert trackers, and it will allow the fox a chance to escape. The bat-eared is a marvelous little animal. It’s unlike virtually anything else produced through the evolution of the dog family. It has these bizarre ears and a bizarre diet to boot. It’s the only dog species that has essentially forsaken meat as major part of its diet. But it’s also known for its cohesive family units and rather moving paternal parenting behavior. Bat-eared foxes are in no way endangered. Their somewhat specialized diet continues to serve them well. At some point, harvester termites might become scarce, but the bat-eared foxes can learn to eat other insects. And there is no evidence that insects in general are becoming more scarce. So even with this unusual diet, the bat-eared fox is doing fine. They are certainly strange-looking little animals. But they certain have behaviors that humans might admire. I bet the part of this post you remember most is the father bat-eared fox taking his little four-week-old babies out on their first termite hunt. We admire animals that are like us– even if they eat bugs!